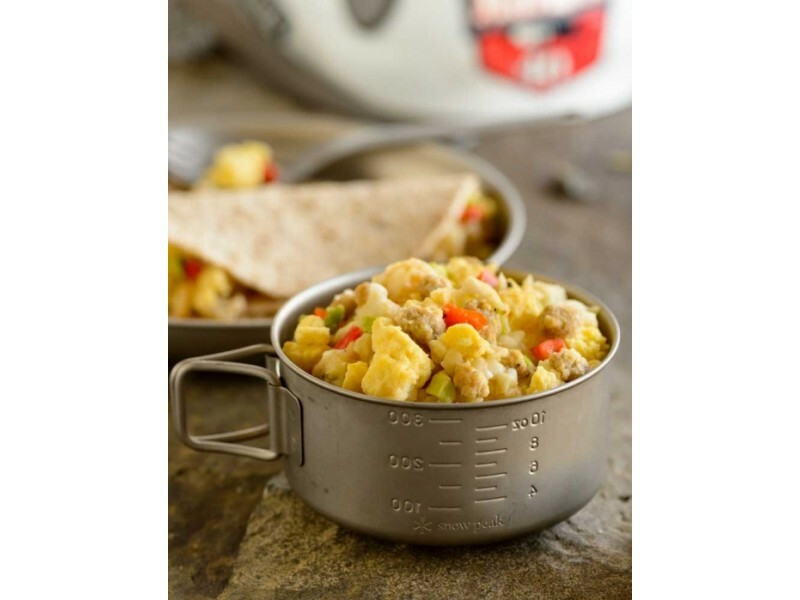 This breakfast skillet is made to help you create your own wrap anywhere you happen to be. 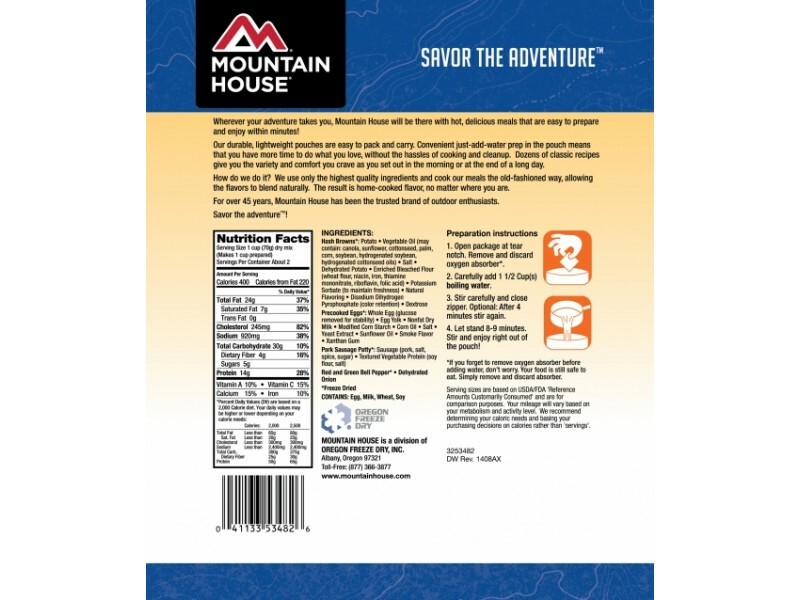 All you need is this great product from Mountain House, and your own tortilla. Of course, you can also eat the delicious hash browns, scrambled eggs, pork sausage, peppers and onions that are in this wrap without a tortilla, if you don’t have one available. No matter how you decide to eat it, you’ll love the taste of this breakfast skillet. In addition, it is extremely easy to cook, which makes it perfect for backpacking, camping, traveling or emergency food storage systems. Buy one today to see if you like it, we’re sure you will. 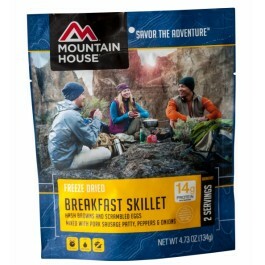 This breakfast skillet from Mountain House’s back packing food line is an excellent addition to any food storage system. It tastes great, lasts a long time on the shelf, and can be easily prepared just about anywhere. In addition, since it has eggs, sausage, peppers and onions, you’ll be getting a diverse set of different nutrients, which are important when in any type of stressful situation. Each serving contains an impressive 14 grams of protein, 4 grams of fiber, 360 calories and a variety of other important nutrients. One serving from this skillet will help fill you up, and keep you strong in any situation. Everything in this skillet was professionally prepared and then freeze dried to help ensure it will last as long as possible on the shelf. It is also packed in a convenient pouch, which you can store just about anywhere. 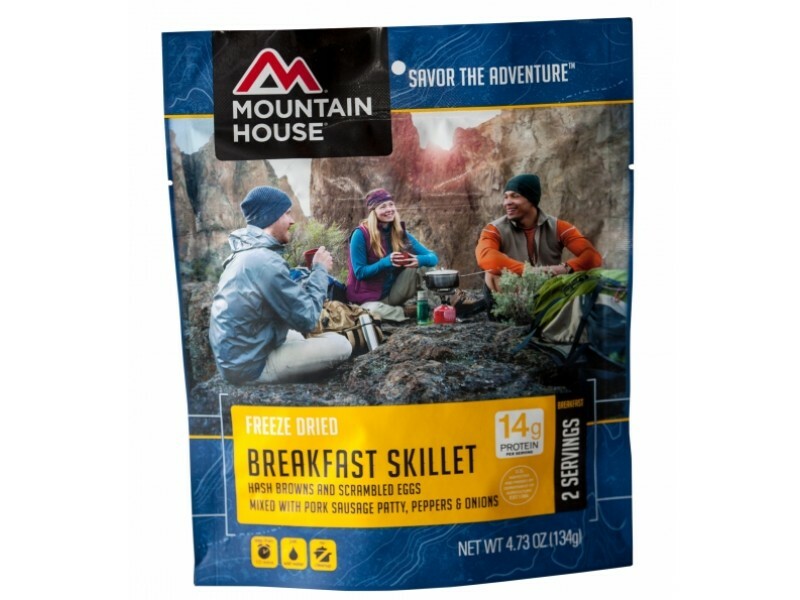 Whether you’re purchasing it for a planned camping or hiking trip, or you just want to add it to an emergency food stockpile, you won’t regret buying this delicious item. In fact, you may want to come back and stock up on many more! INGREDIENTS: Ingredients: *Hash Browns (potatoes, contains one or more of the following [canola oil, corn oil, cottonseed oil, palm oil, soybean oil, sunflower oil], salt, dehydrated potatoes, enriched bleached flour [wheat flour, niacin, iron, thiamin mononitrate, riboflavis, folic acid], potassium sorbate [to mantain freshness], natural flavoring, disodium dihydrogen pyrophosphate [color retention], dextrose), *Precooked Eggs (whole eggs, egg yolks, nonfat dry milk, modified corn starch, corn oil, salt, yeast extract, sunflower oil, smoke flavor, xanthan gum), *Pork Sausage ([pork, salt, spices, sugar], textured vegetable protein [soy flour, salt]), *Red and Green Bell Peppers, *Dehydrated Onions. *Freeze Dried CONTAINS: Egg, Milk, Wheat, Soy. A "Delicious Filling" for your own tortillas! One pouch has 2 1 cup servings.